If you had to decide between the Nikon D5200 vs. the Nikon D3300, which one would you choose? These two enthusiast-level Nikon cameras have similar pedigrees and nearly identical feature sets. It can be challenging to determine which one best suits your photography style. The D3300 implements some advanced features that are missing from its older rival. However, the D5200 holds its own in a few key areas. Read on to explore their unique strengths and weaknesses. Then, hear our verdict. Dimensions 4.88 x 3.86 x 2.99 in 5.1 x 3.9 x 3.1 in. It’s quite difficult to compare these two Nikon cameras, especially since they’re built on the same bones: a 24 megapixel, 23.5 by 15.6mm APS-C CMOS sensor. Used in many classic Nikon beginner DSLR & enthusiast-level cameras, this sensor delivers delightfully vibrant colors, crisp details, and soft shading. Unfortunately, the Nikon D3300 falls behind by not incorporating an anti-aliasing filter. That is a nifty feature that greatly reduces distortion in repeating patterns and comes standard on most DSLRs. This often means clearer and brighter images. However, it can also cause blur the colors and muddle the details of your photos. The D5200 is equipped with an anti-aliasing filter. That tends to boost overall image quality. One area where the D3300 does shine is its low-light performance. It doubles the highest native ISO of its competitor, improving a humble ISO 6400 to a perfectly respectable ISO 12,800. Its upper range can be expanded to ISO 25,600–though not without sacrificing a bit of clarity and vibrancy. Plus, its cleverly backlit sensor captures more accurate colors and more delicate details when light is difficult to come by. Many beginning videographers chose to explore film composition and editing with an enthusiast or professional-level DSLR like the D3300 or D5200. 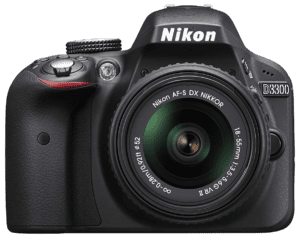 Both cameras are an outstanding introduction to amateur DSLR videography, but the D5200 dominates with a wider range of video-friendly features and functionalities. The Nikon 52000 allows you to shoot at 60 frames per second, while the D3300 is limited to just 24. Although 24fps is often viewed as the cinematic standard, more shooting options give budding videographers the flexibility to explore new styles and aesthetics. The D5200 also features a built-in stereo microphone, allowing you to effortlessly record audio without purchasing a pricey external rig. Both cameras have excellent phase detect autofocus, which keeps your footage crisp and clean even when your subject moves erratically. However, the D5200’s more powerful audio recording system and more flexible shooting options make it far better for capturing great video. Both cameras have excellent phase detect autofocus for both videos and stills, keeping your shots clean and free of distortion and blur. You’ll find it easy to home in on your subject and hold it firmly in focus, no matter how colorful or distracting the background. However, the D5200 has a much more robust autofocus system than the D3300. It boasts 39 autofocus points in comparison to the D3300’s 11, enough to significantly improve focal precision and reduce the time needed to lock onto your subject. In fact, this expanded autofocus system might be the D5200’s most impressive accomplishment over its rival. Hold the D3300 in one hand and the D5200 in the other, and you might just find yourself mixing them up. These two cameras look practically identical, which might have been negative if their designs weren’t so solid and functional. Thankfully, however, Nikon traditionally does an excellent job balancing portable construction, durable build quality, and pleasantly comfortable controls. Both the D3300 and the D5200 have lightweight materials. They also have the same simple, user-friendly layout. The D5200 weighs 555g, while its relative clocks in at a significantly lighter 430g. Nikon released the D3300 a few years after the D5200. So it benefits from a slightly more advanced and powerful processor. The EXPEED 4 is a bit faster than the EXPEED 3 that powers the D5200. It expands the newer camera’s ISO range. It also enables you to shoot in less-than-ideal conditions. You can expand this ISO to 25600 at the expense of some image quality. The D5200 also has a slightly higher dynamic range than its rival, enabling you to capture fine details and silky colors in low-contrast shooting situations. When it comes to the ease and convenience of composing your shots, these two cameras are neck-and-neck. Both have a 3-inch LCD screen—which, unlike the screens on newer cameras, doesn’t respond to your touch—and a crisp, bright optical pentamirror viewfinder. Both also cover 95% of the viewing area, and their magnification factor is nearly identical, so you’ll always have a great view of your subject. The Nikon D5200 can brag that its screen is fully articulated, unlike the fixed LCD of its competitor. While this feature might have been designed for selfie enthusiasts, it genuinely takes the headache out of many shooting situations. That’s why articulating screens come standard on almost all DSLRs, and why it’s a huge advantage for the D5200. The technical specs might make the camera, but who doesn’t want to have a little fun every now and then? Creative image modes can enliven your photography practice and make your next shoot a little more intrepid. The Nikon D5200 features a surprisingly capable time-lapse mode that creates gorgeous, cinematic videos. It’s perfect for all the standard purposes—sunsets, star paths, and nature shots—but is also fun for experimentation with landscapes and portraits. However, the D330 has a fun panorama functionality that makes it easy to compose breathtaking images of the landscape or night sky. Just snap several shots of the scene, then let the camera stitch them together to create a masterpiece. 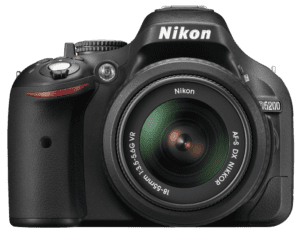 While it’s admittedly difficult to decide between two cameras that are so similar, the Nikon 5200 is probably a smarter choice for the average photographer. The older camera’s broader videography capabilities, expanded autofocus system, and faster, smoother operation make it an excellent tool for the photographer who wants to hone their eye and discover their style. Though, you may need to upgrade your D5200’s lens. However, the Nikon D3300 still holds a slight edge in low-light conditions. Here again, you might choose to spend a bit more on a D3300 lens upgrade. In the end, the best camera for you is the one that you enjoy using and take out of its case most frequently. Why not take both cameras for a spin to determine, once and for all, which one you just can’t live without?